Intense acoustic shock waves were applied to evaluate the mechanical strength of structural epoxy bonds between a TA6V4 titanium alloy and a 3D woven carbon/epoxy composite material. Two bond types with different mechanical strengths were obtained from two different adhesive reticulations, at 50% and 90% of conversion, resulting in longitudinal static strengths of 10 and 39 MPa and transverse strengths of 15 and 35 MPa, respectively. 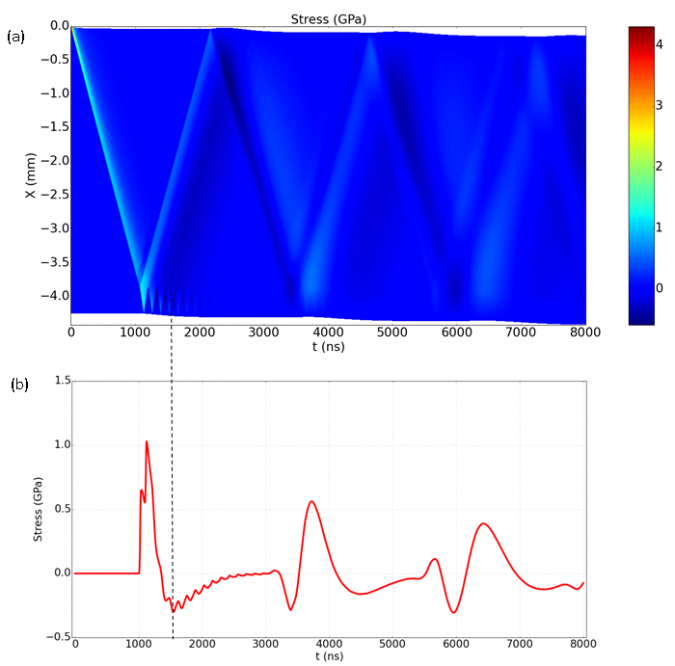 The GPa shock waves were generated using ns-scale intense laser pulses and reaction principles to a confined plasma expansion. Simulations taking into account the laser–matter interaction, plasma relaxation, and non-linear shock wave propagation were conducted to aid interpretation of the experiments. Good correlations were obtained between the experiments and the simulation and between different measurement methods of the mechanical strength (normalized tests vs laser-generated shock waves). Such results open the door toward certification of structural bonding. In 2012, the aviation industry adopted an ambitious set of commitments (for instance, to stop the growth of CO2 emissions by 2020 and to halve emissions by 2050 compared to 2005 levels) to reduce its contribution to global climate changes. One approach is to use lighter structural materials, such as composite materials. However, one main limitation of their use concerns their assembly. Namely, they cannot be welded nor attached using rivets. Thus, bonding is often the only way to attach one composite structure to another. Moreover, bonding can be seen as a “smart” attachment process, as it is compatible with almost all materials, it reduces the weight of the attachment, and it is available from the conception of a structure to its repair. The main limitation of structural bonding in the aircraft industry concerns the ability to certify in a non-invasive way the good quality of the bonding, i.e., to certify that it can resist up to a predefined strength value. To date, however, no method for such certification has yet been demonstrated. Thus, there is a need to identify a quantitative nondestructive evaluation (NDE), able to certify the good quality of structural bonding, to allow further generalization of the use of composites in the transportation industry. This in turn will contribute to the expected CO2 emission reduction.